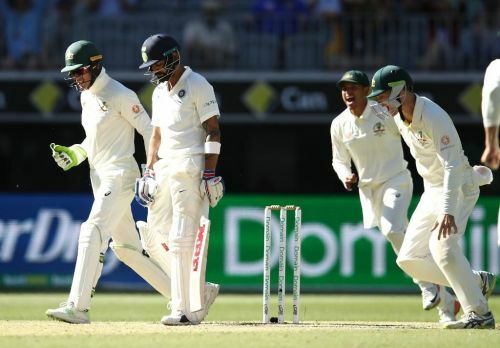 India went into the second Test with a 1-0 lead in the series but at the end of the fourth day, it is Australia who are edging close to a win at the Perth Stadium. After winning the toss, Australia took the brave decision of batting first on a greenish pitch and were duly rewarded. Their openers gave the home team the perfect start as they added a century partnership for the first wicket. In the first innings, three Australia batsmen - Aaron Finch, Marcus Harris, and Travis Head - scored half-centuries. The lower order too contributed with the bat, and helped Australia post a total of 326 on a lively pitch. Unlike Australia, India did not get off to a great start as the Indian openers failed to create any impact on the game. After losing two early wickets, Virat Kohli's half-century partnerships with Cheteshwar Pujara, Ajinkya Rahane, and Hanuma Vihari steadied the Indian innings. Virat Kohli went on to score 123 runs but that was not enough as the rest of the Indian batsmen, barring Rahane could not step up. After Kohli's wicket, India could just add 32 runs for 4 wickets, and conceded a first-innings lead of 43 runs. Adding to their first innings, Australia had to work their way against a testing Indian pace attack. The Australian innings mainly revolved around Usman Khawaja, who scored 73 runs off 213 balls. During the first session of Day 4, he added 58 runs with the Australian captain, Tim Paine. For the fifth wicket, the two batsmen were involved in a 72-run before getting out in quick succession. India took 5 wickets for 25 runs but the last wicket partnership of 36 runs took the Australian lead to 286. While Mohammad Shami delivered his career-best figures of 6-56, Jasprit Bumrah took three wickets in the second innings. India lost KL Rahul and Pujara with just 13 runs on the board. After the first two wickets, Vijay and Kohli tried their best to steady the Indian innings but were outfoxed by Nathan Lyon. After the two big breakthroughs provided by Lyon, Ajinkya Rahane and Hanuma Vihari steadied the Indian innings but the Indian vice-captain was out just before the close of the day's play. Australia are still in the driver's seat as Vihari and Pant are the only two recognised Indian batsmen left. On the final day, India's chances in the Test match are solely dependant on the two overnight batsmen, considering the fact that their tail is not known for wagging long. India will need the two batsmen to perform exceptionally to create history at Perth. Aussie batsmen subdued by Indian pace, Indian batsmen hustled by Aussie spin. Even a few years back who would have thought! KL Rahul: My job is to see off the new ball. New Ball: My job is to see off KL Rahul. Still boggles the mind - they played Rohit ahead of Vihari at Adelaide. Knowing he brought a bowling option. Shami is not bowling a spell. He is casting one. "So Shami doesn't do anything in the first innings and India still pick him?" Would Kohli’s team selection have back-fired if India had lost the toss in the Sydney test?